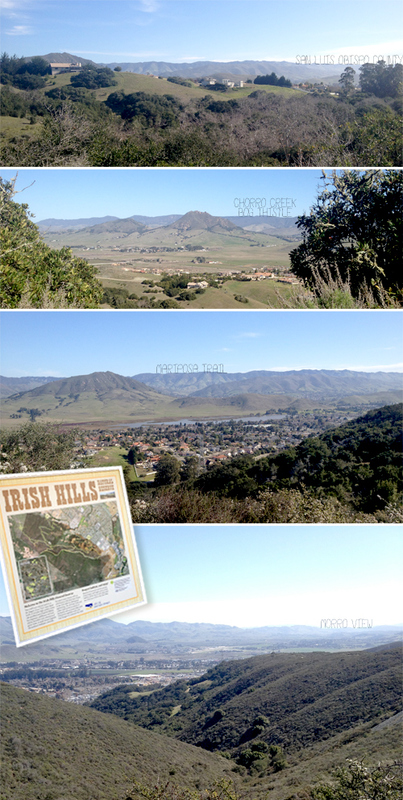 We decided to make the most of the perfect hiking weather so during our recent stay in San Luis Obispo, set off one morning to a nearby hike in the Irish Hills. Nothing too long or strenuous (although I packed enough water and granola bars for the whole day!) There was great signage at the trailhead (and all the way up), including a QR code on the sign so we were able to download a trail map to my phone. The trail was lovely, with beautiful views of the surround area and mountains all the way up. There were some nice looking houses down near the bottom of the hill and as we wound our way up the trail, got to see the whole property from higher up. The round-trip up and back again took a little over two hours (including stops for water, photographs and snacks.) I found it really relaxing and peaceful. Well, except for my fear of encountering a mountain lion (there were warnings on the sign at the trailhead) and a crazy mountain biker who came barreling down part of the trail at breakneck speeds! At the top of the trail we had a view of Morro Bay and the iconic rock in the distance. We really enjoy the pool at the hotel after that!